My old Prof. was a physicist, but it never got in his way! Scientists have been delving into the evolution debate with various small robots to simulate how flight or gliding or simply stability at speed might have been selectively adaptive. DASH, short for Dynamic Autonomous Sprawled Hexapod was a robot investigating stability. Designing a 25 g, 10 cm robot was easy, but they couldn't decide whether it should be a bird or an insect. There was a clue though - it had six legs. UC Berkeley and the Smithsonian TRI (Tropical Research Institute) unintentionally initiated studies on early bird evolution. This research team, led by Ron Fearing, professor of electrical engineering and head of the Biomimetic Millisystems Lab at UC Berkeley, reports its conclusions online in the peer-reviewed journal Bioinspiration and Biomimetics. With feathers on all four limbs, bird fossils show their function could have been gliding. But a terrestrial beast may have gained selective advantage by increasing its running speed using feathers. 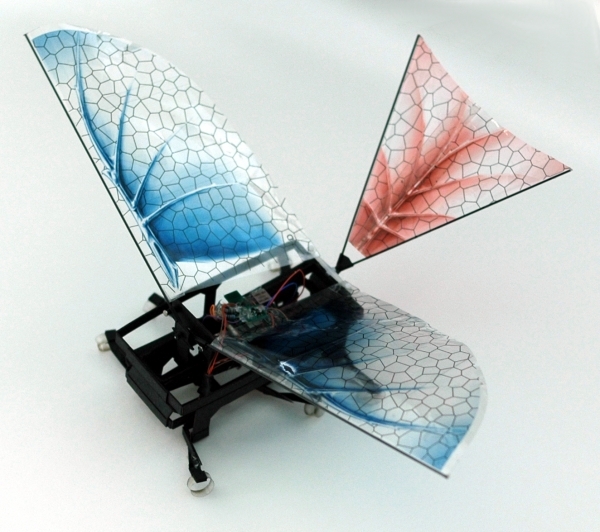 The many researchers now nicknamed their robot DASH+Wings and promptly doubled its running speed. The Smithsonian author is Kevin Peterson. 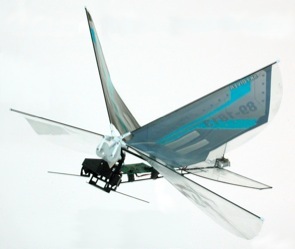 He describes the study as follows: "By using our robot we can directly determine the performance effects of flapping wings on a running platform as well as gaining a much greater mechanical insight into how the wings are actually working on the robot. We are thus able to look at the performance of the wings directly rather than attempting to build theoretical aerodynamic models based on fossil morphologies that may be overly sensitive to various assumptions". He found also that wings allowed for descents with a stable landing on the six legs. An obvious result was the stabilising effect of the wings on running and a sizeable increase in the range of inclines that the robot could cope with. These inclines became as steep as 16.9o with wings, but were only possible up to 5.6o when wingless. In a wind tunnel, inclines of 24-6o became possible. Useful to a forest creature rapidly adapting as other species became adapted to their shared habitat. Professor Robert Dudley of Berkeley came back with the proposition that tripling the running speed for a ground dweller could take it into the air, with the thrust needed for take-off. Others in the Berkeley Biomimetic Millisystems Lab had another idea that their BOLT (Bipedal Ornithopter for Locomotion Transitioning) more closely resembles the precursors to flying birds. We have yet to see how this bird like robot would perform, but Dudley's ground based theory is the direct competitor to those who assert that flying would have started in tree-living gliders. Natural selection will decide!